Since this is the season of root vegetables, here’s a recipe with beets. Ok, so roasting isn’t an age-old Japanese cooking technique, but I think you get better flavor this way. Alternatively, you can boil them, or if you need to save some time, you can even use the microwave. 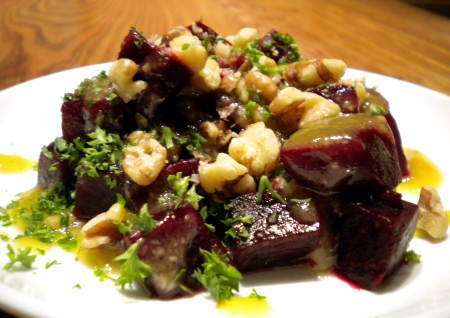 In this dish, the beets are topped with the ‘simple miso vinaigrette‘, toasted walnuts and chopped parsley. Wash and trim beets then place in shallow roasting pan. Roast for about 30 minutes to one hour. Test them using a toothpick. When done remove from oven and set aside to cool. Toast beets either on a baking tray in oven, about 5 minutes, or in a frying pan on the stove. When the beets are cool, peel and cut into qaurters or smaller. Ideally, they should be easy to grab with a pair of chopsticks. Arrange on a plate, sprinkle with crushed toasted walnuts, drizzle on the miso vinaigrette and then garnish with chopped parsley.